On 16 January 2019, Coral Methane successfully carried out her first liquefied natural gas (LNG) bunkering operation on the world’s first LNG-powered cruise ship at Santa Cruz de Tenerife in the Canary Islands. 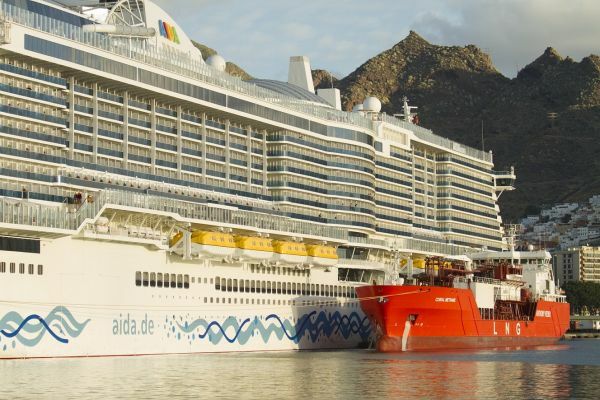 She fueled AIDAnova, the newest ship from AIDA Cruises, which made history as the cruise industry’s first ship to be powered at sea and in port by the world's cleanest burning fossil fuel. Coral Methane is a 7,500 cbm vessel that has been modified from an ethylene/LNG carrier to an LNG bunker vessel for Shell, who are supplying the LNG. Anthony Veder, established in 1937, acquired its first gas tanker in 1969. As an integrated shipping company, Anthony Veder develops long-term relationships with their customers by offering a safe, reliable and flexible service using a wide range of high quality gas carriers. The group is involved in all segments of gas shipping, from LPG to LNG and Ethylene to CO2. Furthermore, the company provides comprehensive and efficient technical and commercial ship management services to third parties. Anthony Veder operates a fleet of 30 gas tankers of which seven gas tankers are fueled by LNG. The Rotterdam based shipping company employs over 1,000 people. More information is available at www.anthonyveder.com.